The Australian Outback is one of the most dangerous areas in the world. Known for its seemingly unending stretches of desert populated with poisonous animals and insects, the Outback is a challenge to travel for even the most experienced adventurer. It was exactly Jake Wilcox’s cup of tea. When Lucia Hagy turned 50, she decided to pursue a new set of fitness goals. However, life had other plans in store for her when she received a surprising breast cancer diagnosis. Greg Soden lives and breathes long endurance efforts, taking part in cycling, running and swimming throughout his life. Greg also dealt with more than a decade of back pain. What impact can a bike make? To the children from impoverished backgrounds who have received a bicycle from the 88Bikes Foundation, the answer is it can be life changing. Sarah Emerson used her running ability to help kids and their families cope with cancer. Just two years later, a routine checkup that she nearly skipped showed she had breast cancer. But she keeps GOing strong. If you walk up to most people and call them “insane,” you can expect to get an earful in return, or maybe even a fat lip. But if you ask Rick Kligman, “Are you Insane?” he’ll likely smile and nod. He not only acknowledges his nickname, “Insane Diego,” he coined it for himself. You might say ElliptiGO bikes have made quite an impression on Francois Lamothe. So much so that he has taken to working them into his “cover” versions of famous paintings. 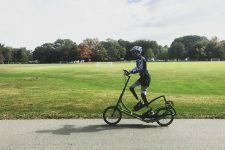 He has turned his love of painting ElliptiGO art into a way to donate to another ElliptiGO rider's charity cause.